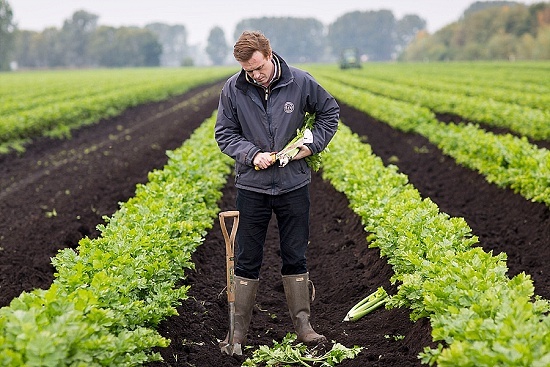 "The phone is just non-stop," says Hamish Mellor, as he checks on early harvests of Fenland celery. 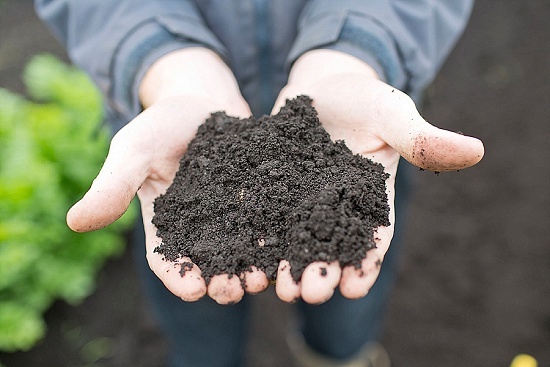 This heritage product is grown exclusively in the jet-black soils of the Cambridgeshire Fens and sold via wholesaler Side Salads here at the Market. 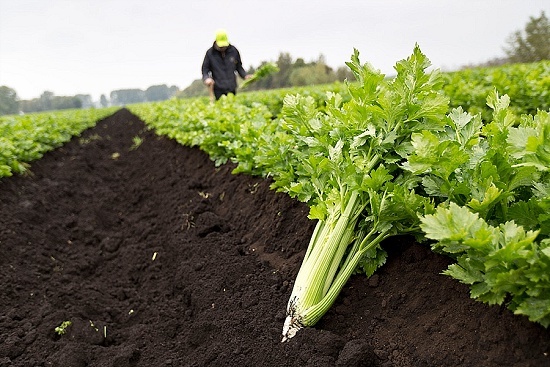 After a two-year application process, Fenland celery became the first vegetable in England awarded the prestigious Protected Geographical Indication (PGI) in recognition of its unique method of cultivation. From January 2016, the use of this logo will become compulsory for recognised products of EU origin in an effort to protect the reputation of locally produced food and drink. 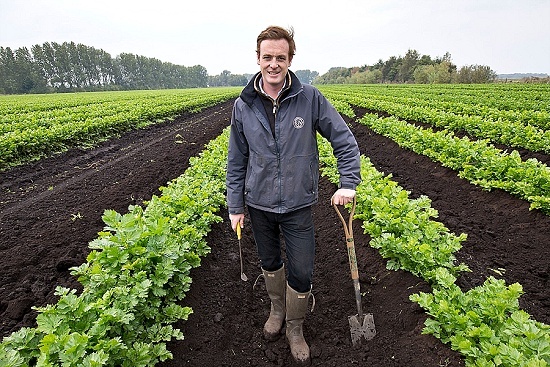 "Everyone in the team was ecstatic [at the award]," says Hamish, Root Salads Crop Manager for G's - the largest salad vegetable grower in Europe. "It was a great breakthrough for us and took some years to get. 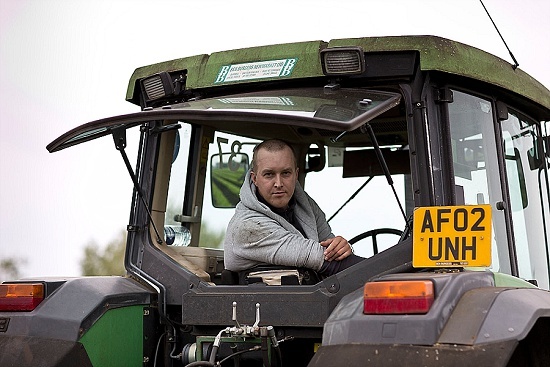 It's revitalising a product that used to be the backbone of the Fens and will stop it going off the shelves completely and becoming almost extinct." 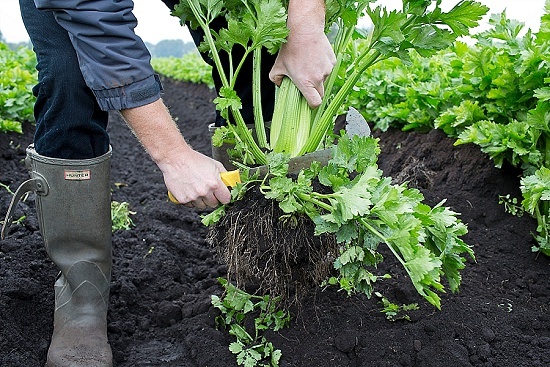 The short season for Fenland celery runs from October to the end of December. 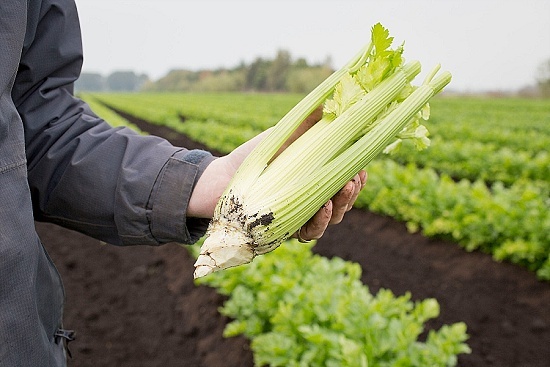 A firm favourite in Victorian times, the heritage crop is renowned for its late harvest, paler colour, and superior taste compared to conventional celery crops. In its heyday, Fenland celery was sent on overnight trains to the original Covent Garden Market, where it was stored in cool temperatures under railway bridges before being washed and trimmed for sale. 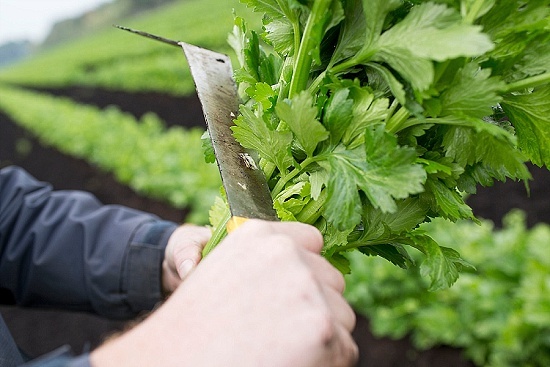 "Fenland celery has got more of a nutty flavour," explains Nick Padley, Stand Manager at Side Salads. "[G's] want to market it as a seasonal product - eight weeks - rather than something supplied all year round." 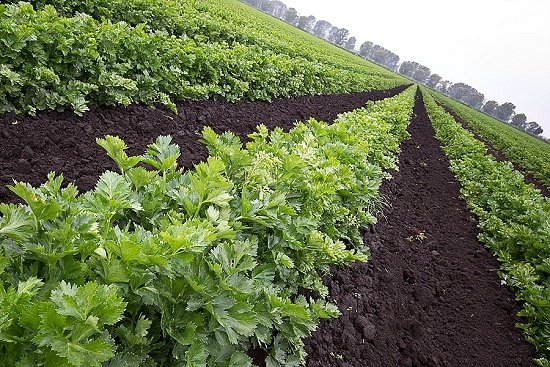 Fenland celery is only grown in certain areas within the dark, peaty soils of the Cambridgeshire Fens, famously rich in organic matter. For the PGI classification, this celery must be cultivated in zones with soil types Adventurers 1 and 2. You can read the full classification details here, and find out more about protected produce in our tutored tasting which featured in The Caterer magazine earlier this year. 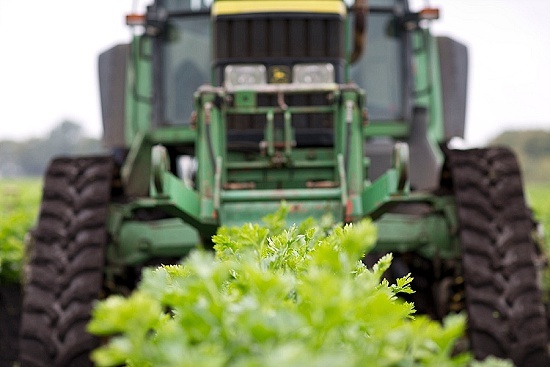 This premium product is far more demanding and expensive to cultivate than maincrop celery - yield per hectare is just a third of the conventional crop at around 25,000-33,000 sticks. (A 'stick' is a term to describe the whole of the plant. A 'petiole' is the correct word for each of the individual stalks). 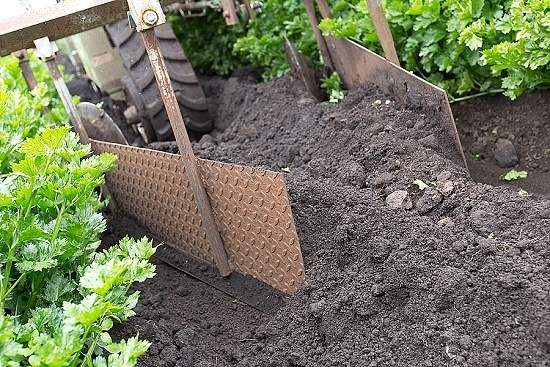 Key differences to conventional celery include the laborious ridging up of soil around the plant. This helps to protect it from frost, blanch it to paler colour and improve flavour. 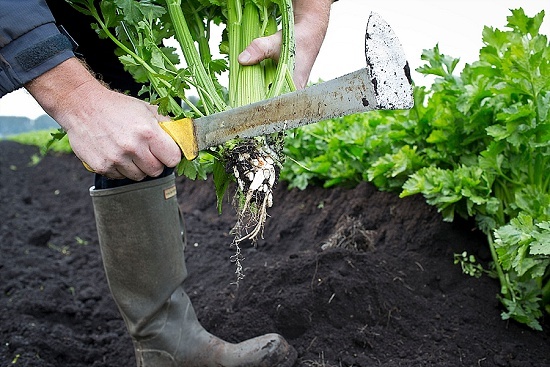 Harvesting of this celery is also more complex, as it is dug out by hand so it can be sold with a pencil-point of root still intact. Two specific varieties of seed are used: New Dwarf White (early; faster-growing) and Fenlander (slower; stronger tasting; flavour improves with a frost). "Both have been around for a very long time. They are very hardy plants and have a good strong flavour," explains Hamish. Seeds are sown in a greenhouse before planting out in blocks in wide rows. 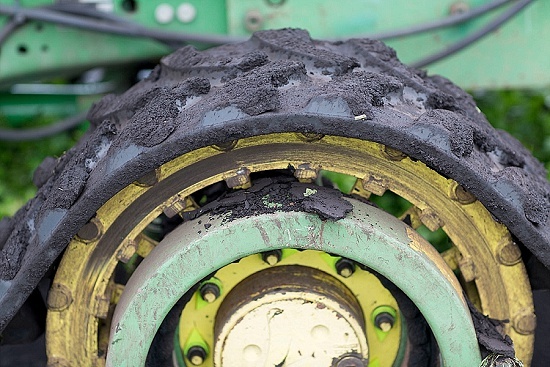 Later, the soil between the rows is broken up by tractor to create a finer tilth before being carefully ridged up around the plants. In Cambridgeshire, G's farm around eleven hectares of Fenland celery with another 290 hectares allocated to conventional celery. Fenland celery is available from Side Salads here at the Market, along with the many other salad vegetables grown by G's. "We've worked very hard along Side Salads to improve continuity and now have regular volumes going in to them every week," states Hamish. Fenland celery is a versatile ingredient in the kitchen. The root has a flavour reminiscent of carrots and celeriac, and is excellent sliced thinly for a cheese board. The peppery leaves are terrific in salads or as a garnish and can also be used to infuse salt with its distinctive flavour and aroma. The root itself is a classic ingredient in stocks, stews or a bolognaise sauce. But it can also be roasted and braised, both popular dishes for Victorians at Christmas. One useful technique is to cut the plant lengthways into quarters before cooking. Hamish is particularly fond of using the petiole in place of a cracker with blue cheeses such as Stilton. You'll find more recipes ideas on the Fenland celery website. G's is hoping that their PGI status will help raise awareness of this distinctive product and boost sales. Consumption of celery has dropped in recent years. "Celery as a category is difficult - it's a very difficult product," says Hamish. He believes the younger generation is less aware of how to cook with the whole plant. The popularity of pre-prepared ready meals also means less people are regularly cooking from scratch. However, recent years have seen an increased interest in niche and high quality food products. "The English asparagus season is something we're hoping to base the celery on," explains Hamish. "More and more people nowadays are looking for artisan products - slightly quirky and with a twist to it." Other classifications in the Protected Food Names scheme include Protected Designation of Origin (PDO) and Traditional Speciality Guaranteed (TSG). Other UK-grown products with awards include Yorkshire Forced Rhubarb (PDO; see our Grower Profile) and Jersey Royal potatoes (PGI), both of which are sold on the Market. Other applications pending approval include watercress (TSG), Denbigh plums (TSG) and asparagus from the Vale of Evesham (PGI). As we leave the fields, Hamish explains that Fenland celery is a particular passion for John Shropshire, who runs the G's company. 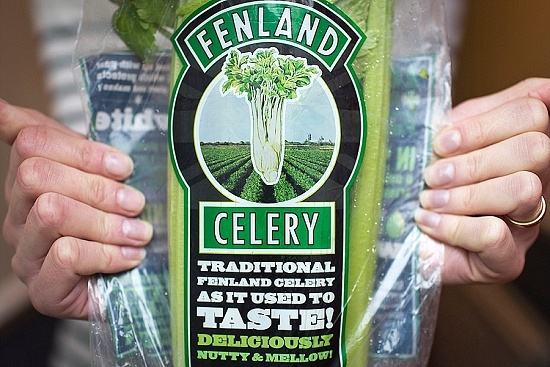 "Fenland celery has been very much a passion of his. He remembers it as a small child growing up in the local area and having the product on his table." Hamish says the company has grown Fenland celery for 50 years but made a strategic decision around a decade ago to invest more time and energy on boosting its profile and sales. 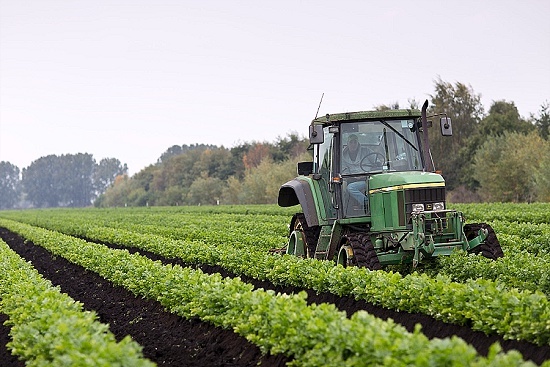 As the largest grower of salad vegetables in Europe, G's operates farms in the UK, Spain, the USA and even Senegal in order to ensure year-round supply to its customers, which include the major supermarkets. "Before coming here I knew of the company but I wouldn't say I knew of the size," says Hamish. "It's only when you get involved and scratch the surface that you start to understand the scale. It's an eye opener."